Looking for a delicious, flavourful and chewy gluten free chocolate chip cookie? 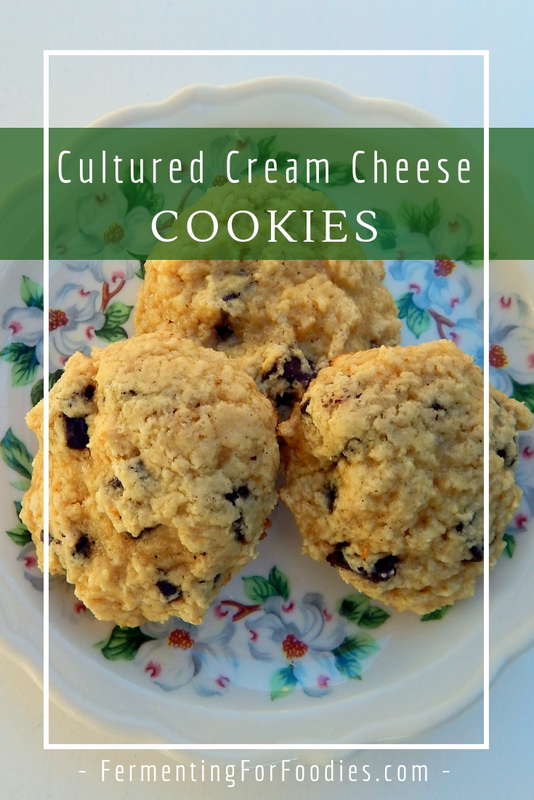 These fermented cookies use cultured cream cheese with whole grain oat flour for a perfect cookie. Though the recipe calls for chocolate chips (a classic!) you can turn it into your favourite drop-cookie by adding in all sorts of different flavours. See the bottom of the post for some delicious ideas. 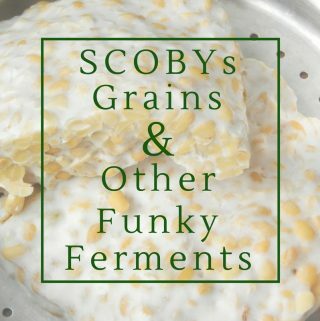 Pre-soaking or fermenting grain breaks down complex carbohydrates, making them easier to digest. 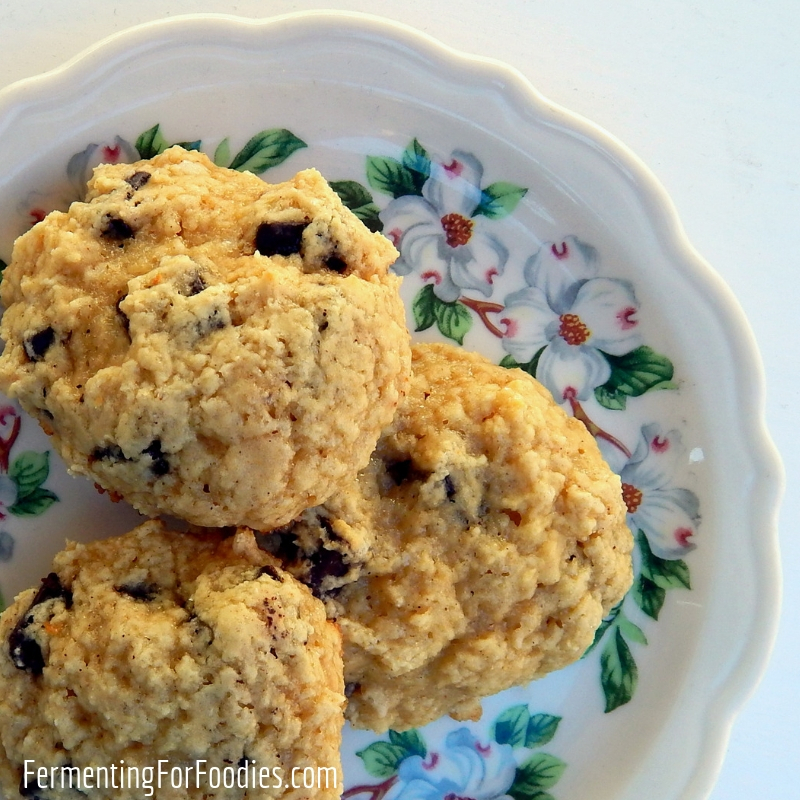 It also helps improve the texture of gluten free baked goods, especially when using oat flour. Mix your flour with the cream cheese and melted butter. If you are using homemade cream cheese, you can use it to pre-ferment your flour. Leave it to sit on the counter for 6-24 hours. Add in the remaining ingredients and mix until smooth. If you haven't pre-fermented the dough, then chill the dough for 30 minutes before baking to fully hydrate the flour for a chewy cookie. Drop ball of dough (about 2 tbsp sized) on a cookie sheet, leaving 2" between each ball as they will flatten as they cook. Bake at 375 F for 8-12 minutes. The cookies are done when they start browning at the edges. Allow to cool for 2 minutes before removing from the cookie sheet. and it’s fine for us! Store-bought cream cheese usually doesn’t have a live culture, so it won’t ferment the flour. If using store-bought cream cheese, then just mix all the ingredients together right away and allow the dough to rest for 30 min in the fridge to harden the butter and fully hydrate the flour. 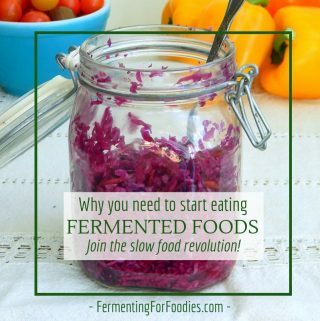 For fermenting, I recommend using homemade cream cheese, strained yogurt cheese or kefir cheese. The added tartness of homemade cheese really improves the flavour. 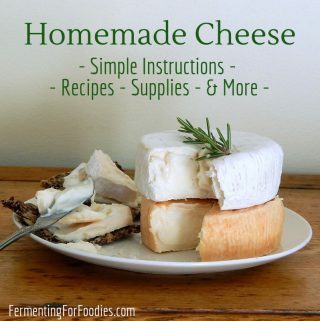 Also, homemade cheese is softer than store-bought, so it’s much easier to mix with. Breakfast cookies: Add in a mix of flax, hemp hearts and raisins with 1 tsp of cinnamon. Energy cookies: Use sunflower seeds and pumpkin seeds. And replace the white sugar with date sugar for a cookie that will give you a long, slow source of energy. Salty Chocolate Pecan: Use a mix of chocolate chips and chopped pecans. Sprinkle each cookie with a pinch of salt. White chocolate macadamia nut: My husband’s favourite… a classic mix of sweet white chocolate and creamy macadamia nuts. with 1 tsp of cinnamon. For a fancy cookie, instead of mixing the cinnamon into the batter, roll the cookie into balls, then roll the balls in cinnamon. This looks amazing! Can’t wait to make this. 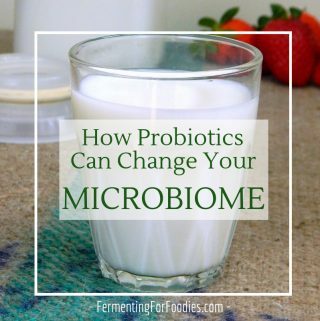 Have you tried to use sourdough starter in place of cream cheese? No… but what a good idea! Definitely on my to do list now. Thank you!